there is actually Greek feel free to correct me, I appreciate learning! way. We use a couple camping chairs for sitting (but a blanket would work too) and an overturned box for our table. ones! We end up getting to talk to our neighbors more than usual and we get to enjoy the weather and sunshine. and mix in your salad, drizzle with sauces. tzatziki, we also like hummus with ours. So the meal consisted of making two sauces, a salad mix, and grilling chicken. tahini in any grocery store I’ve been to, I know I can get it up in Seattle but I can’t justify the gas to get it. pestal. It works great and since I buy my sesame seeds in bulk I’m probably saving money. a cheesecloth and use the remaining cucumber pulp in your sauce. Chop the cucumber and then whirl in a blender. Add the rest of the ingredients and blend until smooth. I use almost all of it). Put into a bowl and drizzle with remaining TBS olive oil and sprinkle with remaining tsp of paprika. it to coat well. Grill the chicken about 4 minutes on each side. Combine the vegetables, parsley and cheese in a large bowl. 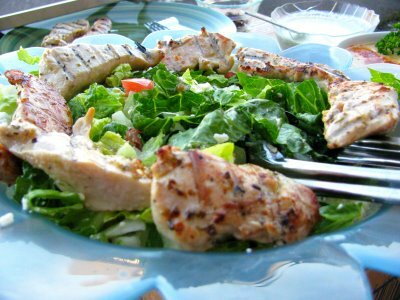 with salad mixture, drizzle with tzatziki and hummus and fold in half. Mmmmm…gyros. Sadly, the manager and landlord of my apartment don’t allow any type of outdoor grilling on the property. So whenever I get the chance, it’s usually at a friend’s place, which is rare. It would be so nice to do it at the comfort of my own home. Looks delicious! I love your substitution for the tahini – I have been looking for it but haven’t seen it in my local grocery store. Yum!! Your Hummus looks scrum-dittly-umptious! YUM! I absolutely love Greek food & gyros are at the top of the list mainly because they're so easy to make! Great recipes! Cheers! Yum! I love gyros and tzatziki sauce! I just finally made the Tzatziki. YUMMMMMMMM!!! I usually buy it pre-made at Trader Joe’s. No more!! This is so much better!